IT HAS A GOOD BUT NOT TO STRONG A SMELL.USE AFTER SHOWERING.AND SOMETIMES I WOULD LIKE IT TO LAST A BIT LONGER. I use this fragrance on a daily basis. 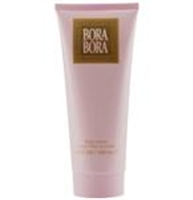 I love the floral scent and it's long lasting staying power. I have NO negatives about this product.